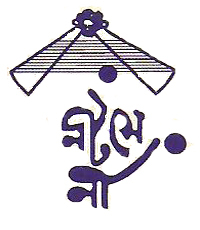 Saroj Ray along with Prof. Subhendu Barik, Shri Samir Ranjan Basu, Swapan Mukhopadhyay, Sujit Saha, Pallab Ghosh, Subrata Nandi and others formed the Theatre Group NATASENA on May 8, 1971 at Thakurpukur, Kolkata. In the earlier days (say upto mid 80s), Natasena used to participate mostly in the competitions of one act plays and award was always a forthcoming event from such competitive shows. Gradually Natasena started performing regularly on different stages of Kolkata and of other places of the country. BISANNA SAKAL (one-act) and KANCHAN RANGA on November 7, 1971. Total Productions: 51 plays (27 one-act) till December 2015. HITEY BIPARIT : (one-act) - a farce by Jyotirindra Nath Tagore. SURYA NEI SWAPNA ACHHEY : (one-act) - protest play against social oppression. BHAJA GOURANGA KATHA : (one-act) - a light comedy, which used to keep audience glued till the curtain-fall. PATAKAR RANG LAL : (one-act) based on the idea that for social justice, assassination cannot be a remedy. JUJU : concocted adaptation of three one-act plays. KOLI BULI : a comedy written in verse and the technique adapted with the Bengali folk opera. CHAMANBAHAR : a fantasy based on the idea of Arabian Nights. PRATIBIDHITSA : a serious three-act based on the character of Abhimanyu of Mahabharat. DHAR MUNDUR KISSA : a fantastic satire in opera form-based on a story of Leo Tolstoy. GORUR GARIR HEADLIGHT : a ‘Kelenkarious - Lacdivorious’ play and still one of the most favourites of the audience even after four decades. Natasena felt proud when it had the honour of becoming the only theatre group to be invited to participate in the Comedy Play Week (Hasir Natak Saptaha) organized by Akashvani, Kolkata and the audio performance of the play ‘Gorur Garir Headlight’ had its Radio Broadcast on 24/03/99 & 25/03/99. In an Inter State Drama Festival held at Khurda, Orissa in 1981, Natasena represented West Bengal with the play ‘Gorur Garir Headlight’ and it won the medals for best production, best director and best actress. Again in 1991, Sri Ajit Das of the group got the honour of the best supporting actor and received the ‘Ritwik Ghatak Smriti Puraskar’ for his performance in the play ‘AUGA’. Natasena dedicated its shows for the welfare of the theatre workers, theatre lovers, destitutes and also took part in charity shows (e.g. about 68 medal winning prizes on account of production and Saroj Ray himself had bagged about 37 medal winning prizes for direction & 97 prizes as actor beside so many bagged by other participants of Natasena) for raising fund for a good cause and the money thus raised in doing so, is totally donated to fulfil its commitment to the society inspite of very little resources. But above all it is only the love and good wishes of the people that NATASENA is carrying on with an individual entity in this troubled time. We bow our head in gratitude to you all..